With immense domain experience and knowledge in the relevant field, we are offering a wide assortment of Brass CP Elbow. To meet the variegated demands of our reputed clients, we are engaged in manufacturing a wide array of CP Elbow. 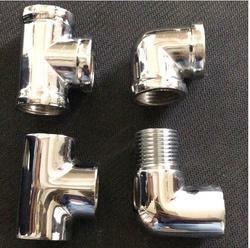 We are dealing in wide range of Brass CP Elbow. Being a leader in the industry, we are engaged in offering a qualitative range of Brass CP Elbow to our clients. - Approx 30 Rs to 80 Rs per piece as per quality, size and market. Owing to the rich industrial experience and expertise in this business, we are involved in providing a supreme quality array of CP Elbow. We are passionately engaged in providing optimum quality gamut of CP Elbow. 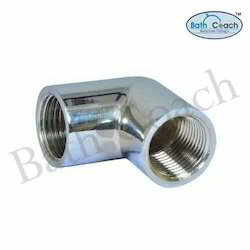 We are highly acknowledged organization engaged in presenting remarkable range of CP Pipe Elbow. Matching up with the ever increasing requirements of the customers, our company provides superb quality range of CP Elbow. This CP Elbow is highly appreciated amongst customers for its easy installation and fine finishing. Furthermore, our product range is designed by using advance technology and high quality material.